Infinity War antagonist Thanos, not content to ruin moviegoers’ lives by menacing the Avengers, has dropped into Fortnite’s Battle Royale mode as of today, Tuesday, May 8. 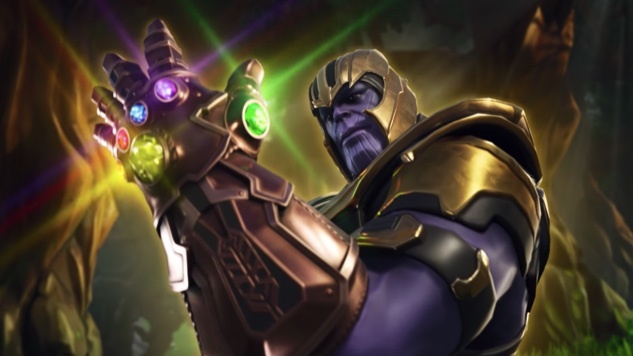 Epic Games and Marvel have teamed up for a Mad Titan-focused game mode, the ponderously titled “Infinity Gauntlet Limited Time Mashup,” at the behest of Infinity War directors Anthony and Joe Russo. The mash-up mode plays out like a standard Fortnite battle royale game—100 players drop onto the map, fighting until there’s only one warrior left standing—only Thanos’ all-powerful Infinity Gauntlet is in play, as well. Whoever finds and equips the Infinity Stone-studded golden glove will transform into the Mad Titan, gaining his fearsome, finger-snapping power (and juiced-up Grimace-like appearance) and laying waste to their enemies, much like Thanos does to most of your favorite Avengers in Infinity War. Appropriately, as players have started testing out “Infinity Gauntlet” mode this morning, Thanos has already proven too powerful for anyone’s liking: According to a Reddit post from Epic developers, they’ve already nerfed the Mad Titan, decreasing both his shield cap and laser damage while boosting his max health slightly. Also of note: At least for now, “Infinity Gauntlet” is only available for solo play, so no squads, and only Rare, Epic and Legendary weapons will appear during “Infinity Gauntlet” gameplay. Check out Thanos’ Fortnite intro below—as you’ll see, he has some seriously game-changing abilities—find the full details of the “Infinity Gauntlet” mode further down and read our spoiler-free review of Infinity War right here. Fortnite’s free “Infinity Gauntlet” mode is now available on PS4, Xbox, PC, Mac and iOS. - Early in the match, a meteor will land in the storm safe zone, delivering the Infinity Gauntlet. - Any player who uses the Infinity Gauntlet will transform into Thanos. - Stats are recorded for this LTM and can be found in the Solo tab. - If Thanos is eliminated, the Gauntlet will fall to the ground, free for the taking. If it sits unused for too long, it will disappear until another meteor appears. - Last player standing will be the victor! - Ability 1 – A mighty punch that knocks enemies back and destroys structures. - Ability 2 – Thanos flies towards the ground, hitting an area for knockback and damage. - Ability 3 – Harness the energy of the Power stone to fire a blast that deals damage over time. - Ability 4 – A super-jump that can vault Thanos over all but the largest obstructions. - Thanos has both shields and health. When he eliminates another player, his shields regenerate. His health never regenerates. - Thanos doesn’t take fall damage. - Thanos does not build, use weapons or things like launch pads. He has no need for such petty human devices. - Maximum match length is roughly 15 minutes. - The match will start with the storm circle already closing in over the island. - The storm does more damage than normal, ticking for 5% health during the first circle and 10% for the rest of the game. - Only Rare, Epic & Legendary weapons will be spawned. - Increased chances of treasure chests spawning from 50-70% to 80-90%. - Increased chances of ammo boxes spawning from 65-80% to 85-95%. - Floor Loot spawns nearly 100% of the time. - Launchpad spawn likelihood greatly increased. - Resources found in loot increased from 30 to 60. - Chug Jug, Port-A-Fort, Boogie Bomb, Slurp Juice, Bush, and Remote Explosives drop rate increased. - Regular Grenade, Shield & Bandage drop rate lowered.